2X - $24.99 Only 4 left! If you are like us, your mamma probably told you that you should grow up to be a doctor. The kind that makes a lot of money…and a difference (if you want). Doctors married well, and have a high social standing. And they are filthy rich. Did she mention how much money doctors make? Well, for some, it is a LOT. But no, like us you didn’t get your doctorate in medicine. Heck, you didn’t even get a doctorate. You got a degree in graphic design, and while you LOVE your job, you also want to get your mom off your back. That’s why this year you have decided to find out what it is like to be a doctor. You asked all your friends who are doctors (well, only Kayla is a doctor, but you still asked her), and you even asked your general practitioner when he was giving you your yearly physical. It was a…weird conversation to say the least. They all said it was hours upon hours of looking at weird things on peoples bodies. You weren’t deterred by their lack of enthusiasm for your mom’s desired profession. No, you got this Plus Size Doctor Scrubs Costume, and channeled your inner surgeon. 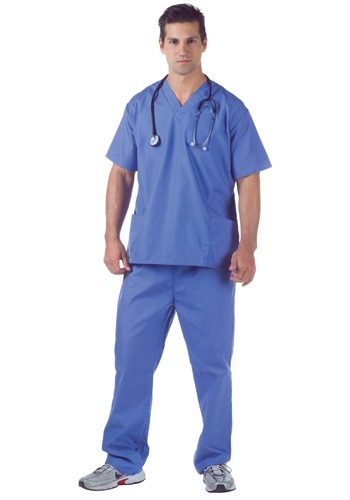 That just means you clicked “Add to Cart” here, and wore your scrubs as you watched old episodes of ER on Netflix. Then your girlfriend was like “Oh, you like medical shows? Let’s watch Dr. Sandra Lee on YouTube.” And after twenty minutes of Dr. Sandra Lee (a.k.a. Dr. Pimple Popper) you were like nope, never could have been a doctor, and only wear the scrubs on Halloween as a joke.